AMD Face Login, AMD Screen Mirror and AMD Gesture Control are available on select AMD A10 APU-powered notebooks. AMD AllDay™ Power – Whether you’re traveling across the country or just across the room, stay unplugged with long battery life and AMD AllDay™ Power. AMD App Acceleration4 – Speed up everyday applications with the power of more graphics cores and AMD App Acceleration. AMD Internet Acceleration – Get your browsing done quickly with Web sites that load fast with AMD Internet Acceleration. AMD Perfect Picture HD8 – See images jump off the page and burst into life in vivid color with enhanced resolution and contrast of AMD Perfect Picture HD. AMD Quick Stream Technology6 – Stop waiting for the buffer to catch up – get fast, smooth Internet streaming with the powerful APU graphics with AMD Quick Stream Technology. AMD Radeon™ HD Graphics – Get everything you ever wanted out of your graphics – crisp & sharp photos, movies and games with the phenomenal discrete-level performance of AMD Radeon™ HD Graphics. AMD Steady Video Technology7 – Remembering your wedding shouldn’t make you queasy – stabilize home videos to help eliminate distracting shakiness with AMD Steady Video Technology. USB 3.0 – Transfer photos and videos from your digital camera & hand-held devices fast with USB 3.0. All models are DIRECTX® Version 11 and UVD 3. AMD Face Login is designed as a convenient tool to help you log into Windows and many popular websites quickly. It should not be used to protect your computer and personal information from unwanted access. Only available on upcoming AMD A10 and A8 APUs codenamed “Richland” and upcoming AMD A6 and A4 APUs codenamed “Temash.” Requires a webcam, and will only operate on PCs running Windows 7 or Windows 8 operating system and Internet Explorer version 9 or 10. Internet connection is required for website login and use of other online features. AMD Screen Mirror is designed to enable the transmission and display of your PC screen on other compatible networked “mirror” devices. Only available on upcoming AMD A10, A8 and A6 APUs codenamed “Richland” and upcoming AMD A6 and A4 APUs codenamed “Temash.” Compatible Digital Media Renderer (DMR) devices are listed on the Digital Living Network Alliance (DLNA) website (http://www.dlna.org/consumer-home/look-for-dlna/product-search) with the “’Play To’ Receiver” feature and must also include H.264 and AAC support. Both PC and DMR device must be connected to a network that will permit content streaming. AMD Screen Mirror supports almost all popular image, audio and video file formats as well as applications showing on your PC screen, but will not mirror protected content. Requires minimum screen resolution of 800×600. Performance may be degraded on networks with limited bandwidth, especially with high definition content. AMD Gesture Control is designed to enable gesture recognition as a tool for controlling certain applications on your PC. Only available on upcoming AMD A10 and A8 APUs codenamed “Richland” and upcoming AMD A6 and A4 APUs codenamed “Temash.” Requires a Web camera, and will only operate on PCs running Windows 7 or Windows 8 operating system. Supported Windows desktop apps include: Windows Media Player, Windows Photo Viewer, Microsoft PowerPoint and Adobe Acrobat Reader. Supported Windows Store apps include: Microsoft Photos, Microsoft Music, Microsoft Reader and Kindle. Performance may be degraded in low lighting or intensely-focused lighting environments. AMD App Acceleration is a set of technologies designed to improve video quality and enhance application performance. Full enablement of some features requires support for OpenCL™ or DirectCompute (including AMD’s Unified Video Decoder (UVD)). Not all products have all features and full enablement of some capabilities and may require complementary products. AMD Eyefinity technology supports up to six DisplayPort monitors on an enabled graphics card. Supported display quantity, type and resolution vary by model and board design; confirm specifications with manufacturer before purchase. To enable more than two displays, or multiple displays from a single output, additional hardware such as DisplayPort™-ready monitors or DisplayPort 1.2 MST-enabled hubs may be required. Maximum two active adapters supported. See http://www.amd.com/eyefinityfaq for full details. AMD HD3D is a technology designed to enable stereoscopic 3D support in games, movies and/or photos. Additional hardware (e.g. 3D enabled panels, 3D-enabled glasses/emitter, Blu-ray 3D drive) and/or software (e.g. Blu-ray 3D discs, 3D middleware, games) are required for the enablement of stereoscopic 3D. Not all features may be supported on all components or systems – check with your component or system manufacturer for specific model capabilities and supported technologies. AMD Perfect Picture HD is a an image, video processing and display technology that features advanced de-interlacing, dynamic contrast adjustment, color vibrancy, noise reduction and edge enhancement that provides brilliant colors and sharp images for smooth playback of Blu-ray and other HD content on your PC. AMD Quick Stream is a technology designed to prioritize video streaming over other activities requiring Internet bandwidth for a smooth, uninterrupted video stream. AMD Quick Stream technology is available on select PCs and requires Windows®7. Not all features may be supported on all systems – check with your system manufacturer for specific model capabilities and supported technologies. AMD Radeon™ Dual Graphics requires one of select AMD A-Series APUs plus one of select AMD Radeon™ discrete graphics cards and is available on Windows® 7 Professional, Windows 7 Ultimate, Windows 7 Home Premium, Windows 7 Home Basic, and/or Windows 8 OS. Linux OS supports manual switching which requires restart of X-Server to engage and/or disengage the discrete graphics processor for dual graphics capabilities. With AMD Radeon™ Dual Graphics, full enablement of all discrete graphics video and display features may not be supported on all systems and may depend on the master device to which the display is connected. Check with your component or system manufacturer for specific mode capabilities and supported technologies. AMD Start Now Technology is a BIOS optimized solution designed to deliver better system responsiveness by minimizing the time to wake up the system from sleep mode, boot the system to desktop and connect to a wireless local area network. Actual times will vary based on operating system, APU, driver, disk drive and memory speed. AMD Start Now technology is available with select AMD APUs when running Windows 7 and Windows 8. Check with your component or system manufacturer or retailer for specific model capabilities. AMD Steady Video is a technology designed to eliminate shakes and jitters during the playback of home video. Users may turn on this technology via the AMD Catalyst Control Center™ or the VISION Engine Control Center application. AMD Steady Video will work with content that can run on Adobe® Flash® Player 10.2 (and later versions) or on any player which has been programmed to use AMD’s decode acceleration (DXVA) engine. AMD Steady Video is not designed to (a) isolate overlays, logos or captions, or (b) improve the playback of letter boxed, premium/commercial, or interlaced content. AMD Steady Video is only recommended for use with videos that contain unwanted shakes and jitters. AMD Turbo Core Technology and AMD Turbo Core Max are available only with select AMD A-Series accelerated processing units. AMD’s A-Series processors combine dual-core and quad-core CPUs and AMD Radeon™ Graphics on a single power-efficient chip to enable premium performance and low power consumption. AMD Accelerated Video Converter – Take your tunes & movies with you – convert, sync and enjoy your video and music files quickly and easily with AMD Accelerated Video Converter. AMD App Acceleration – Speed up everyday applications with the power of more graphics cores and AMD App Acceleration. AMD Eyefinity Technology – Immerse yourself in panoramic gaming and entertainment across up to four monitors with AMD Eyefinity Technology. AMD HD Media Accelerator – Experience HD video the way you should with accelerated conversion and smooth playback from AMD HD Media Accelerator. AMD Perfect Picture HD – Images jump off the page and burst into life in vivid color with enhanced resolution and contrast of AMD Perfect Picture HD. AMD Performance Advantage– Go beyond the notebook with the power only a desktop can deliver with AMD Performance Advantage. AMD Quick Stream Technology – Stop waiting for the buffer to catch up – get fast, smooth internet streaming with the powerful APU graphics with AMD Quick Stream Technology. AMD Radeon™ Dual Graphics – Push graphics and gaming performance to the extreme with the power of two – AMD Radeon™ Dual Graphics. AMD Steady Video Technology 2.0 – Vacation video shouldn’t make you dizzy – helping to eliminate shaking from home video is only one click away with AMD Steady Video Technology 2.0. Automatically stabilize home and Web video with advanced settings and one click control. AMD Turbo Core Technology 3.0 – Amazing performance when you’re pushing your system to the limits, with scaled back power consumption for everyday activities to help extend battery life. AMD HD3D Technology – Become part of the 3D gaming and entertainment experience with cutting-edge AMD HD3D Technology. USB 3.0 – Transfer photos and videos from your digital camera fast with USB 3.0. AMD Face Login is designed as a convenient tool to help you log into Windows and many popular web sites quickly. It should not be used to protect your computer and personal information from unwanted access. Only available on upcoming AMD A10 and A8 APUs codenamed “Richland” and upcoming AMD A6 and A4 APUs codenamed “Temash.” Requires a webcam, and will only operate on PCs running Windows 7 or Windows 8 operating system and Internet Explorer version 9 or 10. Internet connection is required for website login and use of other online features. AMD Eyefinity technology supports up to six DisplayPort monitors on an enabled graphics card. Supported display quantity, type and resolution vary by model and board design; confirm specifications with manufacturer before purchase. To enable more than two displays, or multiple displays from a single output, additional hardware such as DisplayPort™-ready monitors or DisplayPort 1.2 MST-enabled hubs may be required. Maximum two active adapters supported. AMD Steady Video is a technology designed to eliminate shakes and jitters during the playback of home video. Users may turn on this technology via the AMD Catalyst Control Center™ or the VISION Engine Control Center application. AMD Steady Video will work with content that can run on Adobe® Flash® Player 10.2 (and later versions) or on any player which has been programed to use AMD’s decode acceleration (DXVA) engine. AMD Steady Video is not designed to (a) isolate overlays, logos or captions, or (b) improve the playback of letter boxed, premium/commercial, or interlaced content. AMD Steady Video is only recommended for use with videos that contain unwanted shakes and jitters. AMD Radeon™ Dual Graphics requires one of select AMD A-Series APUs plus one of select AMD Radeon™ discrete graphics cards and is available on Windows® 7 Professional, Windows 7 Ultimate, Windows® 7 Home Premium, and/or Windows® 7 Home Basic OS. Linux OS supports manual switching which requires restart of X-Server to engage and/or disengage the discrete graphics processor for dual graphics capabilities. With AMD Radeon™ Dual Graphics, full enablement of all discrete graphics video and display features may not be supported on all systems and may depend on the master device to which the display is connected. Check with your component or system manufacturer for specific mode capabilities and supported technologies. The following picture can click to enlarge. Trinity APU CPU upgrade to the second-generation the bulldozers core Piledriver, the GPU is also upgraded to the second generation DX11 core, enhanced performance while reducing power consumption, which is its goal, two goals from the point of view before the test or the basic realization of a’s. The primary change is the CPU core, the first generation of the APU Llano, using a modified K10 core, the Trinity using a bulldozer architecture inherited a modular design, the four core has two modules, each module shared 2MB L2 cache, Trinity is still no L3 cache. Instruction set AVX, / AVX, 1.1, AES support, of course, ultimately, AMD FMA3 instruction. Pliedriver with first-generation Bulldozer compared to enhance the performance of the IPC (a week of instruction), and lower leakage current, the frequency also increased, desktop-class Llano maximum frequency of 2.9GHz, while the Trinity 2.0-3.8GHz, the former is mainly used in the mobile model, the highest desktop-class CPU frequency up to 3.8GHz. The GPU frequency is similar to the minimum for 424MHz mobile models, the typical frequency of 685MHz, up to 800MHz. 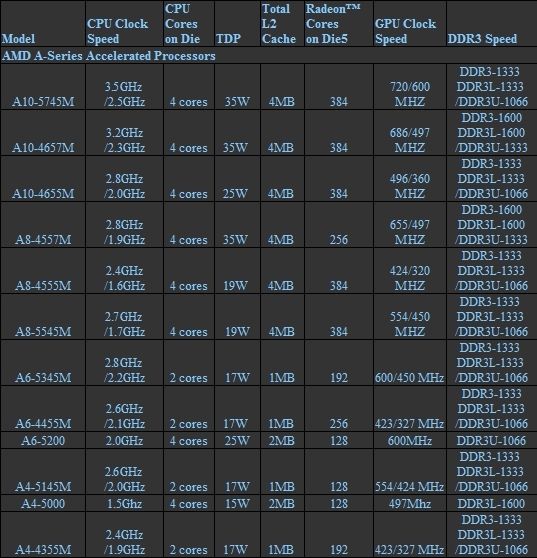 Turbo Core dynamic acceleration technology can also upgrade to the third generation of AMD’s description is not much more advanced power management, CPU and GPU can accelerate. A10-4600M, for example, the CPU frequency of 2.3GHz, the GPU is the default frequency of 685MHz by default, run 3DMark 11 test, the CPU is at full load, the CPU frequency will not improve to run the PCMark test GPU does not need too high load, the frequency will be reduced to 496MHz, the CPU can be upgraded to 2.7GHz, if it is running single-threaded CINEBench, then the GPU is still maintained to 496MHz, but the CPU can accelerate up to 3.2GHz. The second improvement of the Trinity the APU is the GPU part of the Llano, the graphics core of the HD 6000 series VLIW5 system, the Trinity upgrading to more efficient VLIW4 homology with the HD 6900 series, six groups SIMD unit stream processor cores reduce the number of 384, the surface is lower than 400 Llano, but greater efficiency in making Trinity 3D performance enhanced, the value declared before the AMD is increased by 50%. Trinity APU process technology is still the GF 32nm SOI process, However, process maturity should be a good many, unlike last year, Llano so cups. The core area of 246mm2 228mm2 than the Llano APU has increased the number of transistors to 1.303 billion from 1.45 billion in Llano, in other words, while transistor to reduce core area increased. 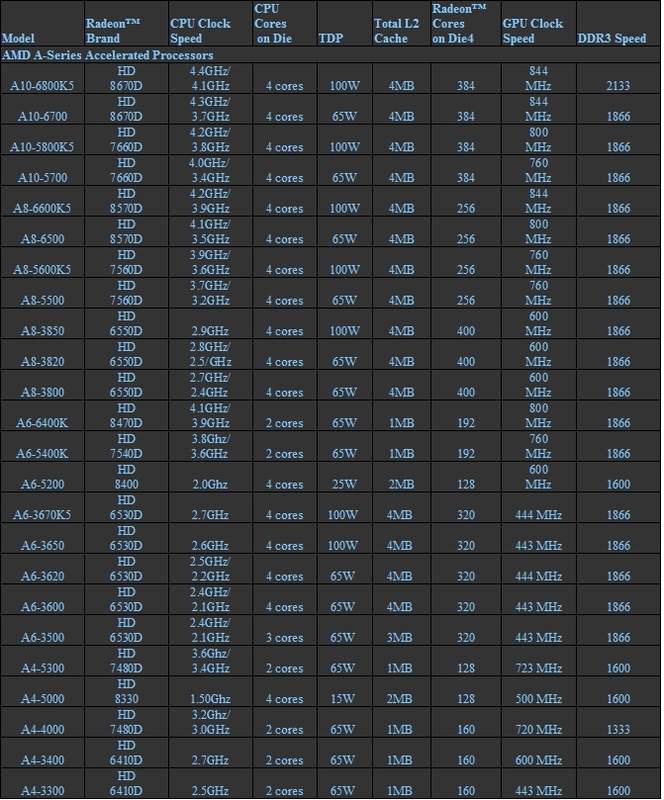 This appears to be negative, but also see the power of the Trinity APU does lower standby 1.08W mobile Model 65W, 17W, 25W, and 35W, desktop-level APU TDP is still maintained and 100W unchanged This is just to design the reference value, specific performance of the power will have to see the actual test. 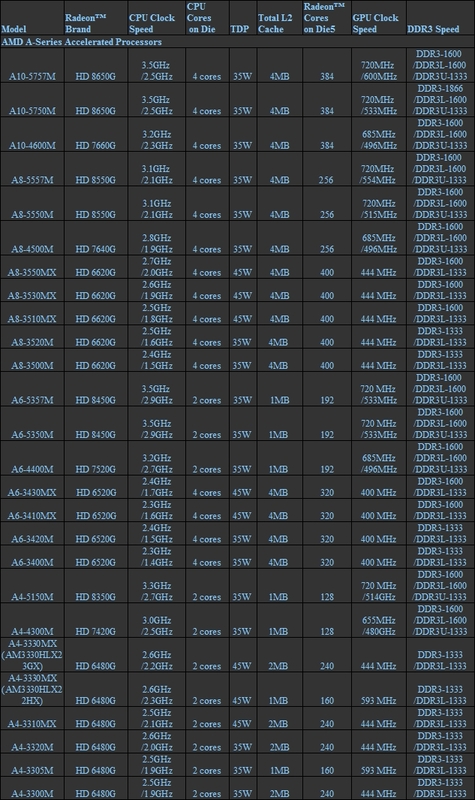 Several achievement tests leaked before the Trinity the APU is to give people confidence, due to the improvement of the CPU architecture, the frequency enhancement and upgrading the GPU, as well as lower power consumption, the Trinity in the low-end market can replace the CPU + alone significantly mix Although this is AMD’s low-end graphics card is not a good thing, but it also than Intel Ivy Bridge eroded better.